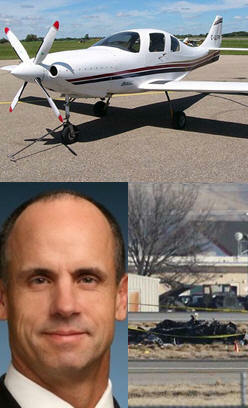 February 5, 2012 - On Friday at approximately 8:56 AM MST, Micron CEO Steve Appleton, 51, was killed in a plane crash at Boise Airport, Gowen Field, Idaho. Appleton was piloting a experimental Turbo-prop Lancair IVP-TP aircraft, tail number N321LC. The experimental fixed wing single engine Lancair aircraft crashed between the two main runways at Gowen Field. Army National Guard and Boise Airport Firefighter units responded to extinguish the fire. Emergency medical staff on site advised of the fatality. Calls were made immediately notifying the National Transportation Safety Board (NTSB). At 2:00 PM media briefing at the airport, NTSB advised that witnesses reported the aircraft had taken off on Runway 10L at approximately 8:46 AM, landed safely, returned to the hangar briefly, then took off again on Runway 10R. First attempt - Appleton: ?One Lima Charlie is going to land here and stop. We?ve got a problem. Thanks.? Tower: ?One Lima Charlie, roger.? Tower: ?One Lima Charlie, do you need assistance?? Appleton: ?Negative. I?m going to taxi back and see if I can figure it out.? Second attempt - Tower: ?Three-two-one Lima Charlie, Boise tower, runway 10 right, cleared for takeoff.? Appleton (64 seconds later): ?Fifty-one, Lima Charlie, I?d like to turn back in and, uh, land. Coming back in.? Tower (15 seconds later): ?Oh my God. Oh my God.? The aircraft ascended approximately 100-200 ft altitude before rolling left and plummeting to the ground and caught fire at approximately 8:56 AM. Appleton's body was thrown from the wreckage. NTSB confirmed that the pilot, a male, was the only person on board, and that personal effects at the scene identified the pilot as Micron CEO Steve Appleton. Boise Airport suspended airfield operations briefly until the runway was checked for debris and determined it was safe to reopen. The single runway was reopened to air traffic at 09:16 AM. No flights were canceled due to the incident. NTSB arrived on scene at 10:50 AM; inspector began interviews of on-scene emergency personnel and witnesses. Coroner was notified and arrived on scene at approximately 11:31 AM. Victim was removed to Ada County Morgue at apx 01:31 PM. On July 08, 2004, Appleton was involved in a pane crash. Appleton was flying an Extra Flugzeugrau GMBH EA 300/L, tail number N609JW, he was performing a variety of aerobatic maneuvers in a low level aerobatic box over flat desert terrain. Two cameras positioned to document the flight sequence revealed Appleton initiated a loop maneuver by pulling the nose of the airplane up into a vertical climb attitude and continuing to the top of the maneuver until in an inverted position. Appleton continued the maneuver by descending on the back side of the loop. As the aircraft was approaching the bottom of the maneuver in an approximately 20 degree nose down, wings level attitude at an altitude of less than 100 feet above ground level, the airplane was observed to make a quick shallow left bank, followed immediately by a second shallow bank to the right. The airplane's wings then momentarily returned to a level attitude before impacting flat open terrain with its right main landing gear and right wing tip. Appleton said he couldn't remember the specific maneuver prior to making contact with the ground, and could not recall being concerned with not having enough clearance to complete the maneuver. A post accident examination of the airplane failed to reveal any anomalies which would have precluded normal operations. Micron released a statement in which they said the company was deeply saddened of the death Micron Chairman and CEO. ?Our hearts go out to his wife, Dalynn, his children and his family during this tragic time. Steve's passion and energy left an indelible mark on Micron, the Idaho community and the technology industry at large.? Mayor Bieter expressed the sentiment of the entire community when he noted "this feels like a loss of someone in our family. Steve taught us that the very best in the world can happen in Boise because he proved it. Micron will continue to be an amazing presence in the city of Boise and whole community. And our community will continue to support Micron." Micron Technology, Inc., is one of the world's leading providers of advanced semiconductor solutions. Through its worldwide operations, Micron manufactures and markets a full range of DRAM, NAND and NOR flash memory, as well as other innovative memory technologies, packaging solutions and semiconductor systems for use in leading-edge computing, consumer, networking, embedded and mobile products.